The award winning Drawmer 1978 builds on the success of the 1973 multiband FET compressor and adorns an unparalleled array of controls to give complete mastering over your mix, and all in a deceptively simple 1U frame. In addition to the usual Ratio, Threshold, Attack and Release controls, the 1978 features four character switches offering a wide range of compression flavours, as well as a variable saturation control to add harmonic distortion to the signal. Side chain functionality is also included with side chain insert points on both channels and a very comprehensive and flexible Side Chain EQ section which offers LF and HF controls with a choice of specific shapes and frequencies for precise frequency-conscious compression such as de-essing. A wet/mix control also allows you to blend the processed signal with the dry for parallel compression. In addition, a fast reacting Dual colour backlit VU Meter is employed to provide a visual indication of the amount of saturation added. Time delay relays are incorporated into the outputs to provide clean power-up and down with no pops or bangs, and a low hum toroidal linear power supply. The Drawmer 1978 is a truly flexible compressor made in the UK with high-quality components. The 1978 is a Buss Compressor like no other - compression with character, controlled distortion, tonal shaping, wet/dry mixing - others have tried but have never managed to build a compressor that is this versatile and yet intuative. It's never been easier to get that elusive characteristic sound that sets you apart from the rest. Glue your mix, bring out the bass, control the highs, add warmth, distortion, smoothen, widen, sound less digital more analogue - and at a price that's right for even the smallest studio. Winner of the Resolution Award 2016 in the dynamics category. A Saturation knob allows you to dial in variable amounts of 2nd and 3rd harmonic distortion, and under complete control. 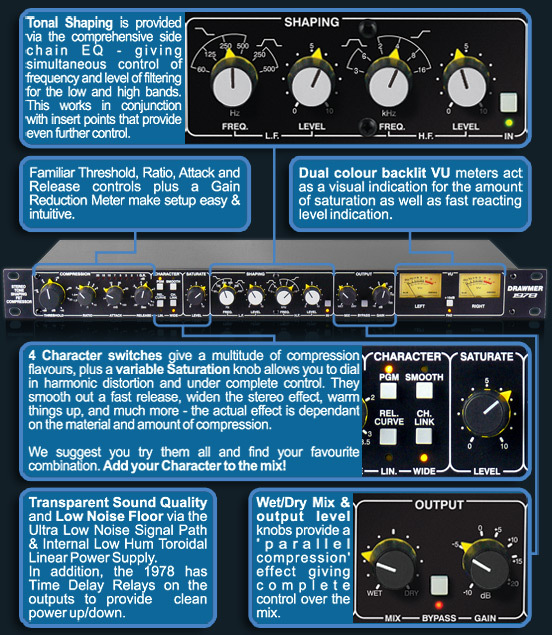 Comprehensive side chain EQ giving simultaneous control of frequency and level of filtering for the low and high bands. This works in conjunction with the rear panel stereo insert points that provide even further control. Variable Wet/Dry Mix plus Output Gain Knobs give a 'Parallel Compression' function without the need for external mixing devices, providing Complete and Effortless Control over the amount of compression used and Output Levels. Two Analogue V.U. Meters with Switchable +10dB Meter Rescale Mode. These have additional dual colour backlighting that act as a visual indication for the amount of saturation. Time delay relays on outputs for clean power up/down. Internal Low Hum Toroidal Linear Power Supply with Voltage Selector Switch. Classic Drawmer Build Quality with Rugged Steel Chassis and Aluminium Front Panel. Mix Control - Pricisely Control the Amount of Compression Applied! Incorporated into the 1978 is the 'Mix' Control. This acts like a 'parallel compression' effect that mixes the Wet (compressed) and Dry (original) signals to provide a simple and exact way of controlling the amount of compression used - all with the turn of a single knob. With the extensive controls of the 1978, such as saturation and tonal shaping, it could be possible to take the effects too far and ruin a mix - this is easily prevented by the use of the Mix control just by mixing in less of the wet signal and more dry. By the same token, the mix control can add more compression and character simply by adding more of the wet signal. It's that simple!